The Achill Yawl Festival (Cruinniú Bádóirí Acla) is an annual series of races involving Achill yawl sailing boats. These vessels are traditional wooden sailing boats, and the races take place in the waters around Achill Island and the Currane Peninsula. The yawls are crewed by local teams and these competitive races offer an exciting spectactor sport and provide a direct link to Achill's maritime heritage. The Achill Yawl Festival usually runs from July until September every year, with races staged at least once a week, and more frequently at holiday weekends. 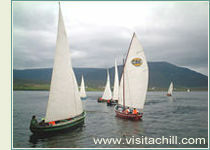 For an up-to-date schedule of races please see the Achill Yawl Festival page of the Achill Tourism web site. In recent years there has been a surge of interest in the traditional Achill yawl. A new workshop has been established in Mulranny where the traditional boat-building skills are being passed to a new generation. The first boat to be produced in this workshop was delivered to a customer in Boston, USA, in 2003. There are also hopes to establish a permanent Yawl Centre at Achill Sound.